The Chinle Badlands at Grand Staircase-Escalante National Monument in southern Utah. Badlands of Hell's Half-Acre, Natrona County, Wyoming. 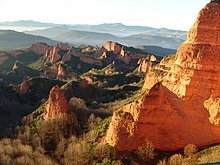 Panoramic view of Las Médulas, Spain. Badlands are a type of dry terrain which is extremely difficult to move across. It happens when softer rock is eroded by wind and water, leaving harder rock sticking up. Canyons, ravines, gullies and other such geological forms are common in badlands. They are very difficult to cross by foot, on horse, or by car. Dry badlands may have spectacular colour displays that range from dark black/blue coal strata to bright clays and sandstone. The term 'badlands' is apt: badlands have steep slopes, loose dry soil, slick clay, and deep sand, all of which act against travel and other uses. They form in dry regions with infrequent but intense rain-showers, little vegetation, and soft sediments which get massive erosion. Some of the most famous fossil beds are found in badlands, where erosion rapidly exposes the sedimentary layers and the scant cover of vegetation makes surveying and fossil hunting relatively easy. Coal seams get exposed in some badlands, so some coal mining districts have developed in badlands areas. An example of this is the Drumheller district of the Red Deer River in Alberta, where the Atlas Coal Mine historical site shows the last of 139 mines which operated in the badlands. Some of the best-known badland formations can be found in the United States and Canada. In the U.S., Makoshika State Park in Montana, Theodore Roosevelt National Park in North Dakota and Badlands National Park in South Dakota together form a series of extensive badland formations. Dinosaur National Monument in Colorado and Utah are also badlands settings. The Big Muddy Badlands in Saskatchewan, Canada, gained notoriety as a hideout for outlaws. There is a large badland area in Alberta, Canada, particularly in the valley of the Red Deer River (where Dinosaur Provincial Park is) and in Drumheller, Alberta where the Royal Tyrrell Museum of Palaeontology is. A well-known badlands formation in New Zealand, the Putangirua Pinnacles – formed by the erosion of the conglomerate of an old river delta – are at the head of a small valley near the southern tip of the North Island. Badlands cut into shale at the foot of the North Caineville Plateau, Utah, in the pass carved by the Fremont River known as the Blue Gate. ↑ Gilbert, Grove Karl, and Charles Butler Hunt, eds. 1988. Geology of the Henry Mountains, Utah, as recorded in the notebooks of GK Gilbert, 1875-76. Geological Society of America, 167. This page was last changed on 21 February 2018, at 17:52.